Show off your steampunk jewelry creations. 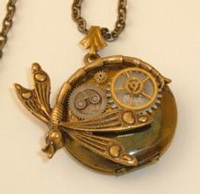 Share your steampunk jewelry creation and how you made it with the rest of the How-to-Make-Jewelry Community. I'm a wire artist but love Steampunk so I came up with some designs to combine them together.